Retired FBI agent Robert Levinson devoted almost three decades of service to his country and the citizens of the United States. A career that deserved honors has instead resulted in almost six years as a hostage in a foreign country. Until his disappearance in March 2007, Levinson, 64, resided with his wife and seven children in Coral Springs. Working as a private investigator, he was researching a cigarette smuggling case on Kish Island in Iran when he went missing. There have been many efforts over the years to locate Levinson and return him home and to his loving family. All have met with disappointing results. 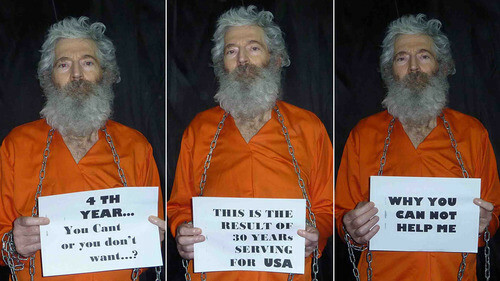 In 2010, the Levinson family received a “proof-of-life” video from his captors. The Federal Bureau of Investigation responded by placing a $1,000,000 reward for information pertaining to his disappearance and whereabouts. To date, there have been no publicized results and the Levinson family feels all but abandoned. Family and friends have set up a website and social media accounts under the username of “HelpBobLevinson” on Facebook and Twitter. Spreading awareness by posting updates on Bob Levinson’s “disappearance” in Iran has become priority one. Levinson’s wife – Christine – released Tuesday five disturbing photos of Bob dressed in an orange prison-type jumpsuit. He had lost weight and has a long grey beard and disheveled hair. In visibly deteriorating health, Levinson is also seen holding signs pleading for help. An analysis of the photographs has led authorities to believe that Iran is behind Levinson’s kidnapping. With such knowledge, the family hopes that the United States will exact more pressure on the Iranian government to free Levinson. According to published reports, the Levinson family received the photos anonymously by email in late 2010 and early 2011. With Tuesday’s release comes a heightened attempt to encourage media awareness and governmental attention. The Levinson family is now attempting to secure Bob’s freedom through a recently created White House petition process under the Obama Administration’s “We the People” website. “Make rescuing US Citizen Robert Levinson being held hostage in the Middle East since 2007 a top priority,” states the petition. The family notes on the website that Levinson is the second-longest-held hostage in American history, second to Terry Anderson, held longer in the Lebanon Hostage Crisis. As of now, the petition has almost 11,100 signatures. To be successful, it must have 25,000 by January 20th – the day before President Barack Obama’s inauguration in Washington D.C. When Robert Levinson finally returns home, he will be proud to find his son pursuing the same career path that he took. The entire community can help the Levinson family by signing the petition and promoting it through social media. In order to warrant an official response from the White House, 14,000 more signatures are required by Sunday. For more information about Bob Levinson’s disappearance, please visit www.helpboblevinson.com. For more information on the $1,000,000.00 reward being offered by the FBI for information on his disappearance and whereabouts, please visit tips.fbi.gov.